Oslo rocked onto the front pages around the world last week after the newly-elected city council announced modern plans for improving the quality of life in the city. The global headlines focused on one aspect of the new plans: making the city centre - within the Ring 1 - car-free by 2019. We covered the bigger picture here on Copenhagenize.com, because it’s even more spectacular than a single headline. What is also interesting is watching the reactions in Oslo to the news, something that doesn’t get covered after the headline gets bumped to below the scroll and enters “Related Link” land. Globally, Norway is probably percieved as a progressive country with a cool capital - lumped together with the other Nordic capitals and The Scandinavian Way. One might assume that the local reactions would be suitably progressive and cool with an “of COURSE we’ll do this” undertone. The reality is a little different, however, when you see the reactions in the week after the announcement. As ever, there are two camps. One is the progressive group that supports this modernisation of the Norwegian capital. Regarding the news as a given and a natural upgrade to city life. This group, by and large, are informed and have done their research to confirm that a car-free city centre makes societal, financial and environmental sense. Data is in their back pocket. The other camp is reacting in much the same way as their counterparts in other cities around the world. A lot of anger, arrogance, indignation, speculation - and not a lot of data to support their desperate position. They all appear to be people who don’t travel much or do much research. Similar things happening in other cities around the world are conveniently ignored in the attempt to grab headlines. It’s all a classic scenario, as though the script for such urban dramas are recycled like so many soap operas. You have to be able to read Norwegian to get the full scope of the debate and the humour involved but those who are interested can google translate the details. 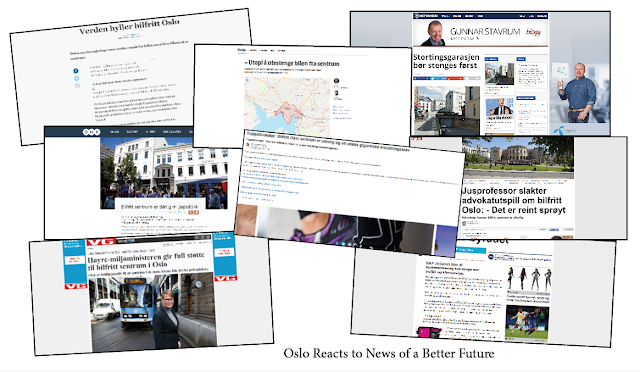 Firstly, the newspaper Aftenposten looked at the global reactions and wrote an article about how “The World Praises a Car-free Oslo” - putting together a compilation of global press coverage. This is probably the best reaction to the local whining you can get. One of the best articles I’ve read is heavy on sarcasm and humour, picking apart the politicians who have been voicing their dissatisfaction with the new plans. “Hallucinations in the Capital”. Here are some excerpts. The head of the traffic committee, Linda Hofstad Helleland (Høyre party), searched feverishly for a powerful enough metaphor and finally found it among the other ghoulish content: “The new city council wants to build a Berlin Wall around the city”, she said to VG newspaper. Just when it couldn’t get funnier, secretary for Fremskrittspartiet (ultra-right wing), Jøran Kallmyr entered the competition with “With these politics you can’t even run a pub. I can’t see transporting beer on a bicycle”, he said to Nettavisen. He should get a passport or at least an internet connection. Beer on bicycles? What about transporting goods by bicycle? The writer goes on to ridicule the protesters by highlighting that similar plans are already in place in London and Lyon with reductions in car traffic of 30% and 20% respectively thanks to congestion charges. And Hamburg’s plans for a network of green spaces, pedestrian zones and bike infrastructure. Munich’s growing parking restrictions. Copenhagen’s car-free zones and bicycle infrastructure. Helsinki’s plans for car-free neighbourhoods. Madrid’s car-free zone that will grow in size. Next up are more usual suspects. Oslo Handelsstands Forening (OHF) - the business development association in the city centre. In their rant entitled “Car-free City Centre is bad Environmental Policy”, they whine about Big Box stores in the suburbs killing off the city centre and the fall in pedestrians on the main streets. Presented in the classic way - claiming that more cars are required in the city centre in order to bring life back. These people have no data to support their cause. They don’t understand that Oslo city centre must become a modern, attractive destination - which it isn’t really at the moment. The plans for a car-free city centre are a gold mine for commerce. Modern. Progressive. Profitable. Commerce and Bicycles, baby. Like many business associations, they don’t know how people get to their shops. They just assume, blindly, that cars are the primary source. That is highly unlikely. Without concrete, neutral data, these people are not worth listening to. In their rant they manipulate the truth - which is a nice way of saying that they’re lying - about a street redesign on Kirkegata in 2011. Saying the city added bike lanes illegally, which isn’t true. It was badly communicated and implemented, but not illegal. They claim that shops closed because of it. Which has never happened anywhere. Take a Google street view tour of the street. The same old same old whining was heard back in the 1960s in Copenhagen, when the city made a main street into a pedestrian zone. Cries of “we are not Italians!” from the locals. We don’t want to walk! We want to drive! Cries that faded almost instantly after the pedestrian street, Strøget, was opened. Interesting reading, in Norwegian, is Gehl Architects analysis, which hammers home the point that public transport users and pedestrians are the people who spend money in the city centre. Motorists are at the bottom of the list. There is a great response to their statement by Olav Torvund on his blog, which gave them a good spanking. In an age of wacky people thinking up new ways to hate on bicycle infrastructure - this woman in San Diego and this church in Washington, DC, Oslo doesn’t want to be left out. Some lawyers from a law firm called Arntzen de Besche declared in a right-wing newspaper that a car-free city centre in Oslo would be “illegal” and they banged their jungle drums about a massive court case by private citizens and owners of parking garages. They are obviously nothing more than ambulance chasers desperately looking for jobs. It didn’t take long for another article to show up, by a law professor, debunking these lawyers’ claims as “nonsense” and completely out of left field and without any legal precedent in Norwegian law. The Norwegian Automobile Association (NAF), not surprisingly, also commented on the plans in a right-wing newspaper, Nettavisen, that clearly has an anti-bike policy in their content. NAF says that the plans are “unwise” and that they fear that they can create more traffic and emissions. They don’t bother backing up their claims with any reliable data, which is something we’re used to by now. They say it’s “unwise” when they don’t know the consequences. Which we do. From scores of cities around Europe. Typical fear mongering to support their car-centric view. People who need a passport and an internet connection. Then there are surprises. The national Environment Minister, Tine Sundtoft from the right-wing Høyre party, was happy to contradict her fellow party members - like the Berlin Wall lady - by coming out in full support of the plans. She is “very positive” about the city centre being car-free for private vehicles. She encourages other cities in Norway to follow suit. This is great quote from her: "It's clear that there are many advantages to restricting private car ownership. We also have to look at facts. In the core of the city centre today, 93% of people going to work do so in an environmentally-friendly way. Only 7% use a car to get to work in the centre of Oslo. Sometimes these debates are warped because you could get the impression that the numbers are reversed." Data. Rationality. Modernity. Progressive mindset. Urban renewal.